This charming evening tour combines a typical Italian dinner in a traditional restaurant accompanied by local wines with a panoramic evening tour of Rome. 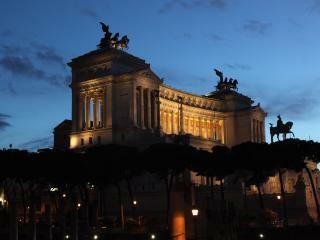 Experience the beauty of the Eternal City by night as you pass by a host of famous and important illuminated monuments. 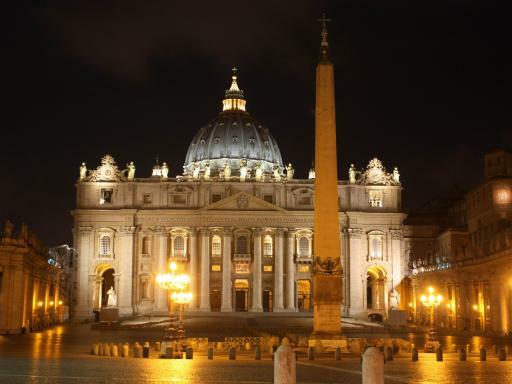 This memorable evening visits iconic sights of Rome at night and includes a visit to a typical local restaurant where you enjoy a wonderful Italian meal complimented by local wine and folk musicians. 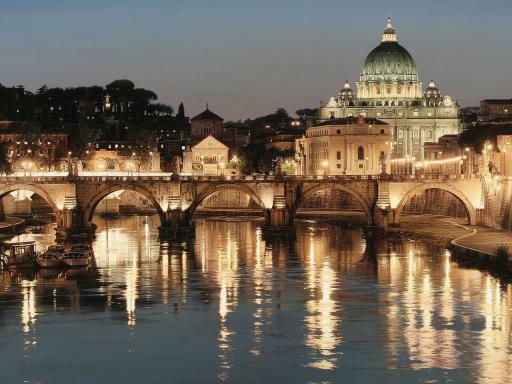 Embark on a panoramic tour of illuminated Rome, enjoying views of her most famous sites. 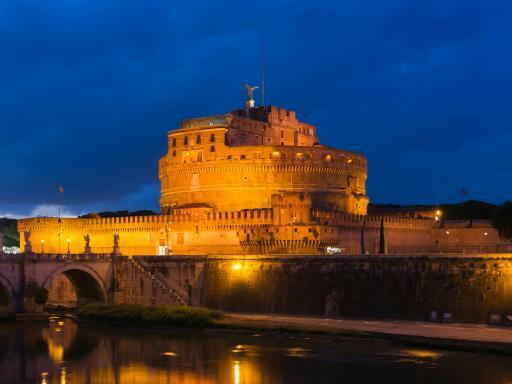 See Castel Sant'Angelo and the magnificent Basilica of St Peter - seen as a backdrop to Bernini's impressive colonnade, before passing through Piazza Venezia to see the monument in honour of Vittorio Enmanuele II. 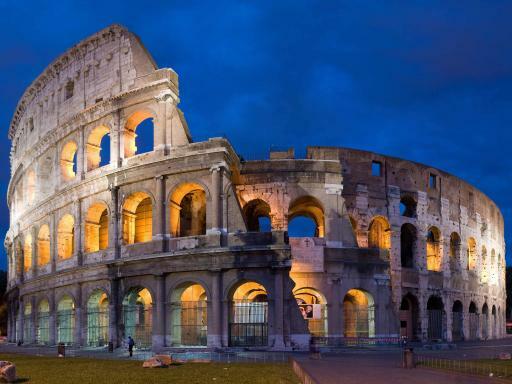 Also watch out for the Roman Forum and Colosseum, Arch of Constantine, Circus Maximus, Theatre of Marcello and the Jewish Quarter with the large bronze-roofed Synagogue. 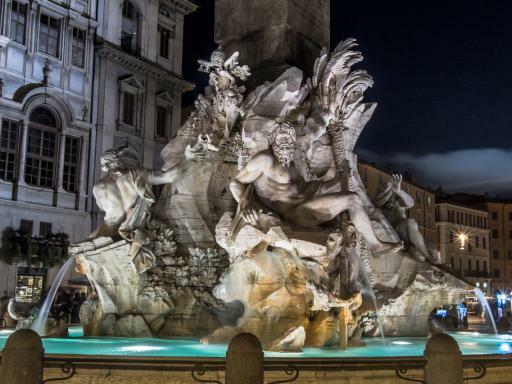 Your tour continues with a pleasant walk through the historic heart of Rome to see the Palazzo Farnese before strolling to the enchanting Campo de Fiori and concludes at Piazza Navona, the baroque square famous for Berninis' masterpiece, the Fountain of the Four Rivers, which is now a cosmopolitan meeting place. Departs: Tuesdays & Saturdays year round. 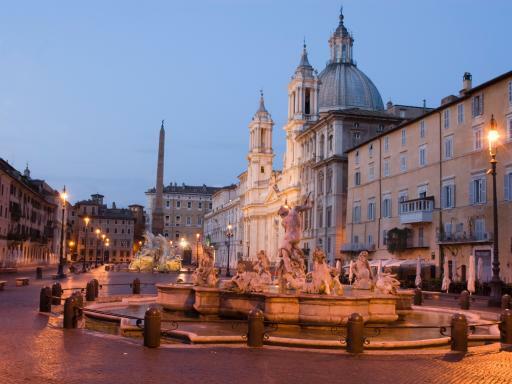 There is an additional departures on Thursdays & Sundays between April and October. Start Times: 7.00pm (Nov-Mar) or 8.00pm (Apr-Oct). Please advise at time of booking of any food allergies. 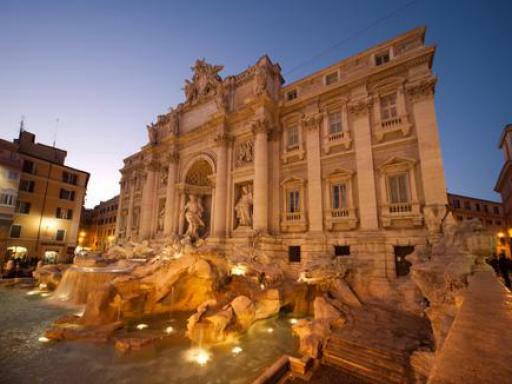 Due to the narrow nature of some of the streets in central Rome it is not always possible to pick-up from directly outside each Rome hotel. Unfortunately this tour is not suitable for guests with wheelchairs. This is a group excursion and guests will be sat at tables with other guests during dinner - a table for 2 is not available.